The position of Flight Attendant is one of prestige and immense responsibility. Recruitment is conducted according to operational demands and there can be periods of up to 12 months where no new intake is required. However, applications are always welcomed. After you submit your initial application online, the Kiwi Air HR Services Team review the details you have provided. Candidates whose details closely match the requirements of the position are then contacted via email advising that their application has progressed to the next stage of the recruitment process. Potential candidates are then asked to attend a Walk-In Day. This could occur several weeks or months after the original application has been submitted depending on current needs. The Walk-In Day consists of a brief presentation about the role and a short interview. Candidates who are successful on the Walk-In Day are notified within 10 days and invited to attend an Assessment Centre. Please note that candidates are required to pass a swimming test before attending the Assessment Centre. At the Assessment Centre, candidates attend an interview as well as participating in a number of assessments. Verbal references are then requested, and candidates attend a medical check. At times, there may not be a need to recruit for Flight Attendant positions. However, the company continuously maintains a ‘recruitment pool’ of those who have completed the Assessment Centre stage. 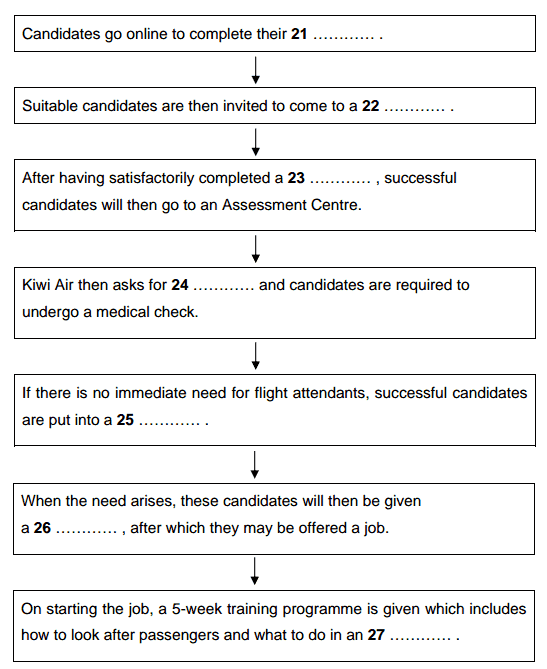 These candidates are contacted when a need for Flight Attendants is established, and attend a full interview before a decision is made on whether to extend an offer of employment. Due to the volume of applications received, Kiwi Air is not able to offer verbal feedback to candidates at any stage of the recruitment process. Unsuccessful candidates may reapply at any time after 12 months from the date at which their applications are declined. Upon being offered a role as a trainee Flight Attendant, a 5-week training course is undertaken at our Inflight Services Training Centre in Auckland. This covers emergency procedures, customer care and service delivery, and equipment knowledge. To successfully complete the course, high standards must be attained and maintained in all subjects. Write your answers in boxes 21 -27 on your answer sheet.